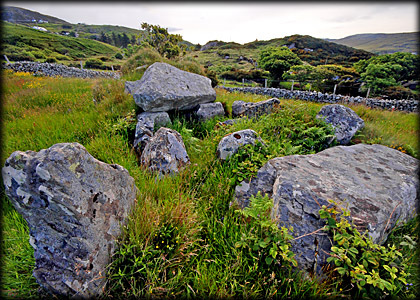 Before reaching station 9 on the Glencolumbkille Turas, the pilgrims would have passed by the large ruined court tomb at Farranmacbride. The tomb has always been associated with the Turas and at times been known as station 9b. The cairn was originally 60 metres in length, with a large central court over 20 metres in length by at least 10 metres in width. It is believed to be the biggest court in Ireland. Sadly the tomb has been bisected by a modern track way that runs north-west to south-east. The tomb consisted of two galleries at either end of the court facing each other. These two galleries are now in separate fields. There were four symmetrical set burial chambers placed around the court. Most of the tomb is situated in the eastern field, with probably the best remaining gallery in the western field. It is believed that a line drawn through the axes of the two galleries would pass through the rocky outcrop at station 2. This further proves the importance of these outcrops to the tomb builders. On my visit the grass in the fields was very long, making it very difficult to see any stones remaining from the court. It is well worth stopping at this tomb, known locally as Munnernamortee Cave. Situated: Situated: From the church head east along straid and take the first left. Travel about 200 metres along this road. Walk passed station 9 to the next bend in the road. Just passed a house on the left is a small wooden gate. Enter here and walk along the path over a stone stile. The tomb is in the two fields also on your left. Discovery Map 10, G 5351 8551. Last visit June 2010.